FeedbackSocially facilitates easy setup of the team so that one could easily kick off a 360 degree feedback. 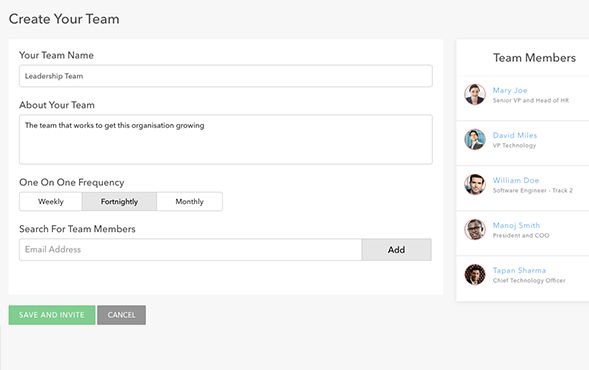 Behind the scenes, it automatically creates an organization hierarchy so that leaders could see the feedback of all their employees. FeedbackSocially allows every organization to define their set of competencies for a 360 degree feedback. The competencies could differ based on the role and responsibilities of the team member. One could add as many questions as possible for the review. The process is made simple by only having three types of questions - ability based, behavior based and open ended questions. Once the team and competencies have been setup, a leader could kick off a 360 degree feedback for his/her team by inviting peers. 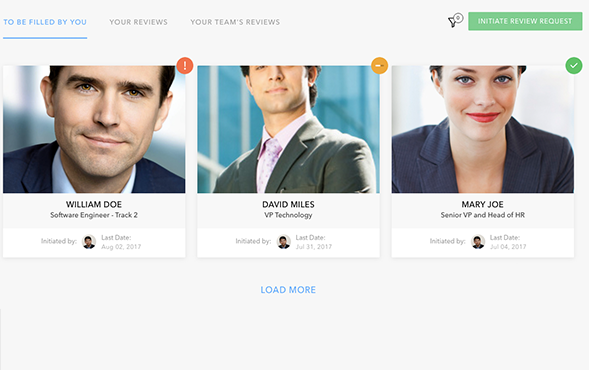 Peers could be anyone who has worked with the team member being reviewed. They could, of course, submit their feedback anonymously. The system sends them invitation and reminder emails to complete the feedback. 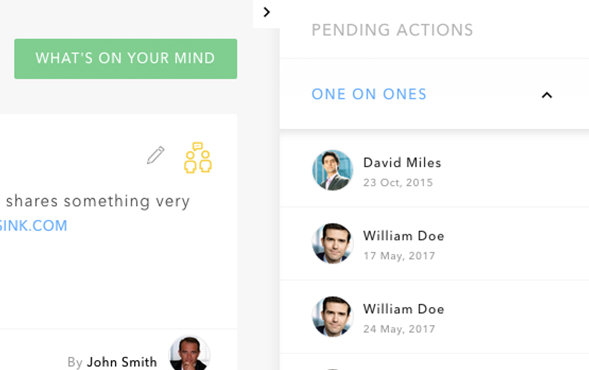 The dashboard shows good visual indications of the status of the feedback of one's team. One could easily see the feedbacks that haven't been started, are in-progress or have been completed. 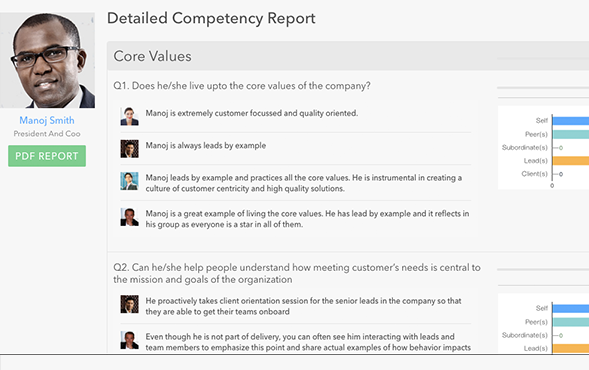 The summary of the 360 degree feedback is shown once all the team members have completed the feedback. The 360 degree feedback report breaks down the entire feedback by peers, direct reports and leaders. It summarizes the rating and facilitates comparison with self-rating and the organization benchmark. A team member could even download the entire 360 degree feedback report in the PDF format. Appreciation is a medium to share your thoughts about someone who has done an exceptional work. It conveys your goodwill which is visible to everyone else in the organization or team. It can also be called “share the happiness of working together”. The One On One allows a leader and a team member to discuss the performance and overall emotional health of a given team member. The team members share what's going great, what could be going better and the areas of improvement in their One On Ones. 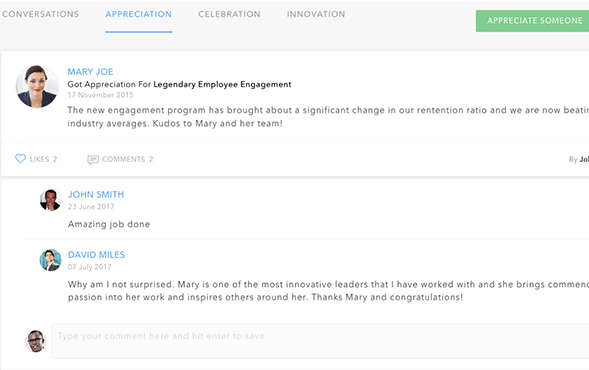 Once done, their feedback shows up on their leader's dashboard. Leaders can create a follow up for any important action items, whether it's a reminder of a milestone, team member's development plan or their engagement level. Leaders and team members can be reminded and nudged for pending One On Ones, follow-ups and any other tasks related to One On Ones so that everything is on schedule. FeedbackSocially facilitates creating Objective and Key Results based on your organization's focus areas. It helps you measure every objective by defining specific key results. An objective is only marked complete when all the key results have been achieved successfully. Once the goals are defined, a leader can collaborate with team members to identify which of the key results match with the team member’s aspirations. A leader can then assign a key result to as many team members as needed. 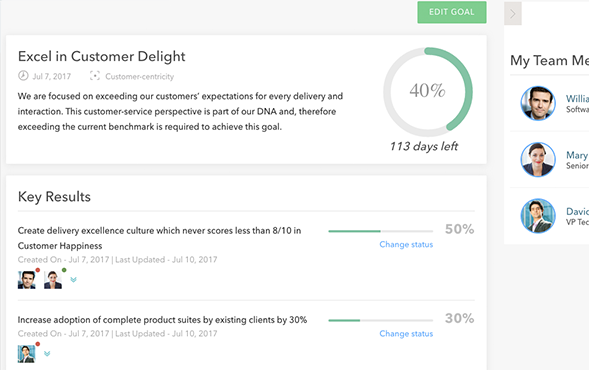 Team member’s OKRs are thus derived from their leader’s key result. The team member can further create their key results and share with their team, creating a network of shared goals that includes everyone. 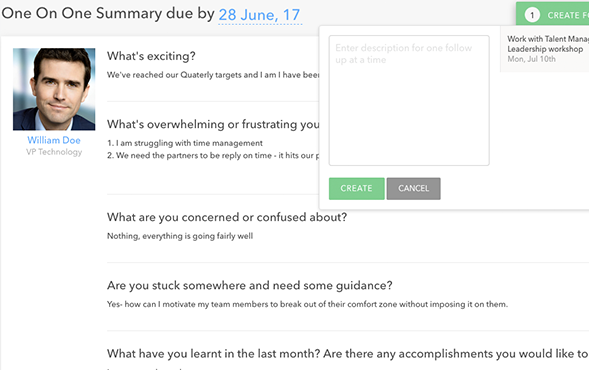 Every member can monitor progress of his or her own goals from the goals dashboard. Leaders get to know status of all team members for each key result as well as the overall level of accomplishment. 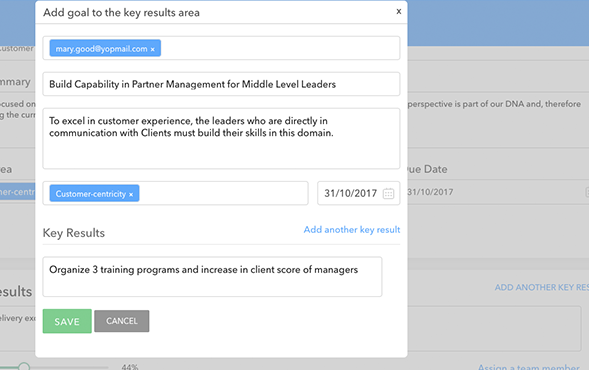 As and when team members complete their goals, percentage completion of the key result increases which cascades up towards the goal completion. The team collaborates using the discussion board to set priorities, confirm completion or resolve questions. 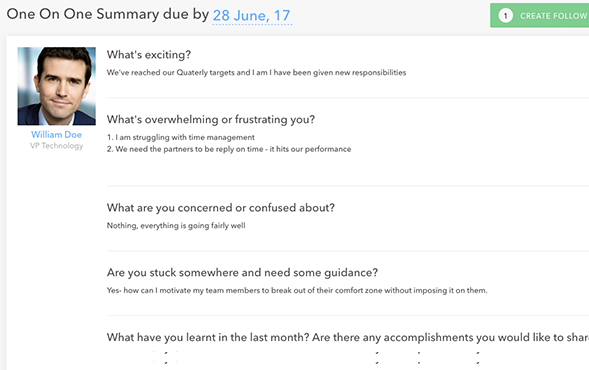 FeedbackSocially Goals provide a lean and visual timeline to enhance comprehension on the progress across all objectives and key results for all team members. 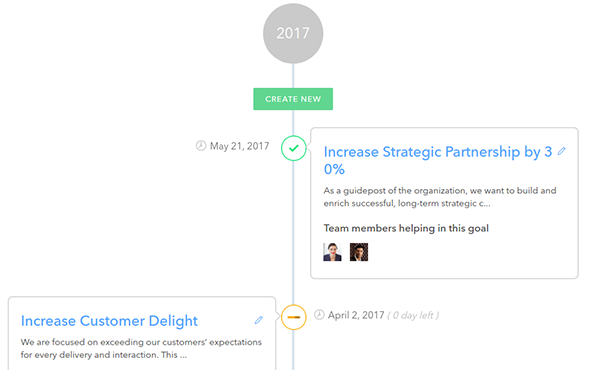 In a snapshot, leaders can easily see the days left for completing different goals, current progress, the team members assisting and the status of their progress. Are you ready to nurture your team's talent? Building your team and organization hierarchy is extremely simple. 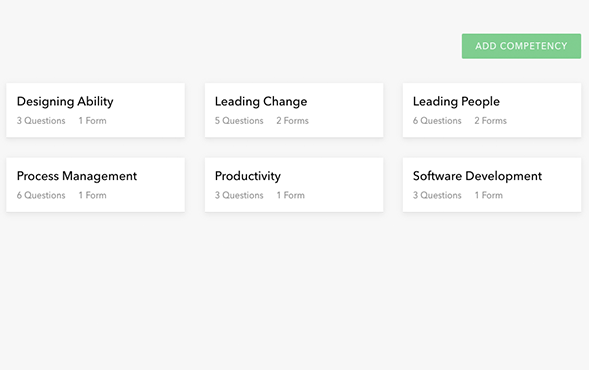 Once setup, you can easily manage One On Ones and 360 degree feedback. 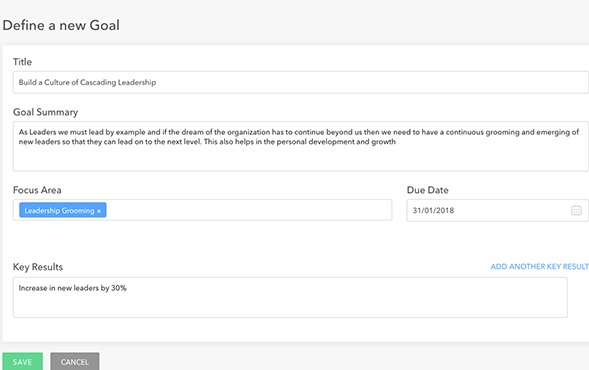 FeedbackSocially is completely customizable and you can define competencies to evaluate based on the types of roles within your organization. You can initiate feedback of your team member by selecting the competencies to evaluate and a peer group. 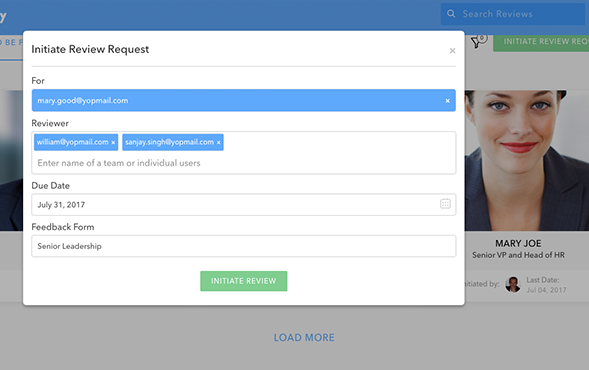 It even has an option for peers to give feedback anonymously. The reports give insights of scores across various competencies. It neatly organizes the strengths and improvement areas. Define OKRs based on your organization's focus area and individual aspirations. See your team's goals in single goal timeline view. You get to know the pulse of your team by having your team members share what's going great, things that could be going better and suggested areas of improvement. FeedbackSocially facilitates SMART goal setting, peer reviews, employee progress conversations and peer recognition to create an employee first organization.